The need for speed. | Views of an atheist techno-pagan. How did the world turn into such a race track? And before you think I speak riddles: I mean motorways, freeways, Autobahn. Fill in the name depending on where you are. 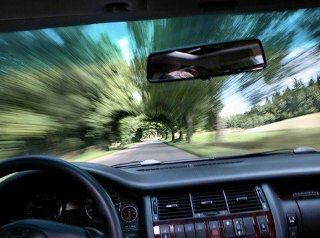 If you have a car, how fast do you drive? And why do you drive it at that speed? Do you stick to the speed limit because faster is an offence? Do you go over the speed limit because it is a thrill? Or because you will be on time if you do? Or do you drive a lot slower? I drive slowly. My speed on the motorway usually averages that of trucks. 80 to 85km/hour, about 55 or so mph. Is that slow? Sure, why not? People told me that there’s no fun in driving that slowly. It takes so long to get somewhere, all others are overtaking you, yadda yadda yadda. Yesterday I did an experiment. I drove 120km/hour, about 78mph. Guess what? All but 2 cars overtook me. Right, that takes care of the argument that others overtake me, they do so anyway because they like to race like madmen, and of course madwomen. Well, with regular petrol only costing €1.82 per litre (think around $8.50 a gallon), what’s against that, right? It’s a cheap enough drive then. My car is an eco-car. A Toyota Auris Full Hybrid. When I drive it the way I do now, I get almost 25km to the litre, about 60 miles per gallon. Works for me. The time I spend is my own, no one else’s, so that works for me too. And I get to see a lot more because I don’t race around like a fool, pushing to be in the rat race, going faster to do more, to be there in time, to do what the big lugs of the global economy expect everyone to do. I’ll continue to take things easy. Time to hurry comes when there is a reason to, not because the rest of the world prescribes it. I’ll drive at my slow speed, see the trees and the cows, and the occasional sparrow-hawk or buzzard that sometimes sit on perches and signs along the road.